Recommendation: Take 1 tablet twice daily with water at mealtimes. For intensive use: Take 2 tablets twice daily with water at mealtimes. Cellulose, starch, modified cellulose, modified cellulose gum, magnesium stearate, silica, titanium dioxide, stearic acid, caramel, wax (coating). Take 1 tablet twice daily with water at mealtimes. For intensive use take 2 tablets twice daily. Cellulose, modified cellulose, starch, modified cellulose gum, magnesium stearate, silica, titanium dioxide color, stearic acid, caramel color, wax (coating). Take 1 tablet twice daily with water at mealtimes. For intensive use take 2 tablets twice daily with water at mealtimes. Nature’s Way Ginkgold (60mg) contains pure ginkgo biloba extracts standardized for active glycosides and terpene lactones. The active ingredients in Nature’s Way Ginkgold have been observed to increase blood flow, improve mood, boost memory and support mental health. Most notable is ginkgo biloba’s ability to positively affect circulation to the brain. 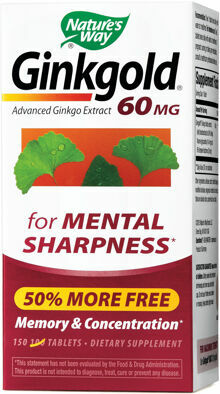 This action is thought to be the driving force behind much of ginkgo’s cerebral benefits. Ginkgold (60mg) is standardized to contain the ideal amount of ginkgo biloba extracts shown to provide optimal benefits. If you’re looking to improve your focus, concentration and mental energy, be sure and pick up a bottle of Nature’s Way Ginkgold to help you get there in a safe and natural manner. Clinical studies conducted with Ginkgold show that that it supports healthy circulation to the brain as well as the extremities. This is achieved by maintaining healthy blood vessel tone and reducing blood viscosity. Additionally, Ginkgold is a proven antioxidant and free radical scavenger. Take 1 tablet 2 times daily with water at mealtimes. For intensive use, take up to 2 tablets 2 times daily with water.